DFX Audio Enhancer for Windows 10 - a program to improve the sound quality during voice messages in instant messengers, in the process of watching movies or listening to music on the Internet or through any player on the PC. The software is a fully automated tool. The utility supports a huge number of web browsers and multimedia players: Firefox, Opera, Chrome, Windows Media Player, Winamp, VLC media player, iTunes are among them. After installation, the user must select the software with which the program synchronizes. The toolkit includes various presets, a spectrogram function. 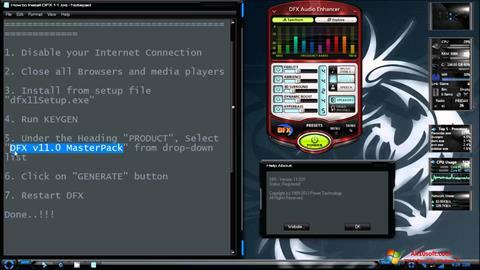 You can free download DFX Audio Enhancer official latest version for Windows 10 in English.